The exhaust gas temperature sensor HTS (High Temperature Sensor) was developed by BorgWarner BERU Systems in Germany. Since January 2014 this product was taken over by Sensata. Due to its closed housing design it is particularly suitable for particle-loaded exhaust gases up to a gas temperature of 900 ° C. It is primarily suitable for diesel engines but also for stratified charge gasoline engines. It is applicable for use in stationary engines, off-road units, range extenders, marine engines, domestic heating, industrial furnaces, exhaust gas recirculation pipes, furnace inspections, etc. 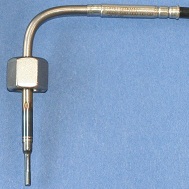 The standard versions offer an immersion depth of 50 mm and are equipped with 1 m cable including a Hirschmann (MLK) connector. Part No. 20 100 represents the straight version, whereas No. 20105 is bent 90°. Both can be easily read out by the display unit DU-EGT. Together with the welding socket SO-200 it is part of our EGT-Set. Please read more below. 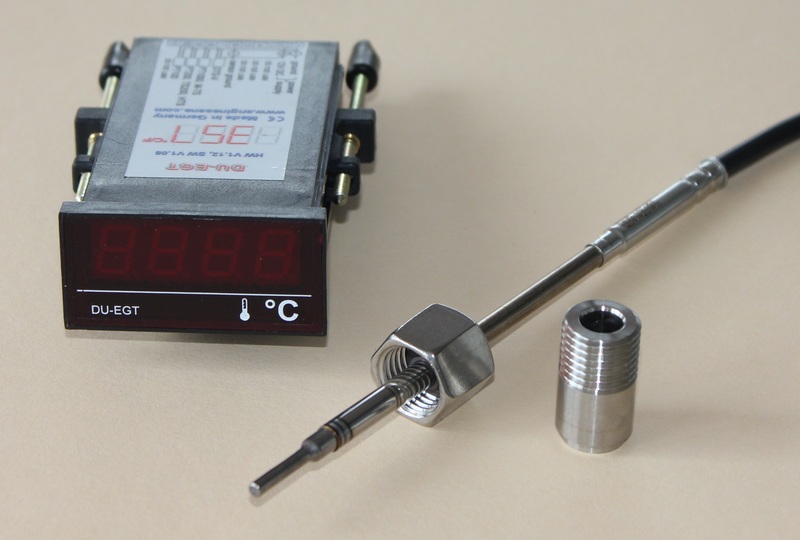 Speecial versions for turbocharger applications with 35 mm immersion depth are available on demand.